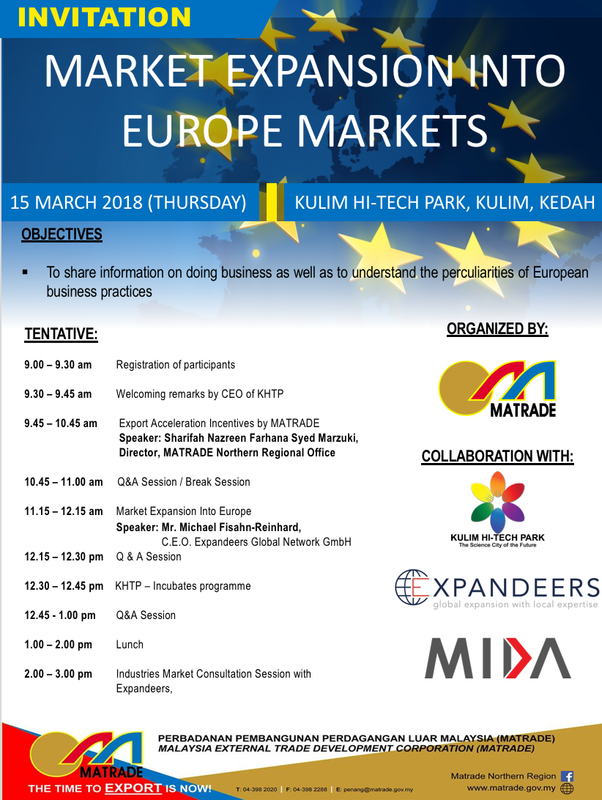 We are inviting any SMB and also interested Partners to join us on March 15: Matrade and MIDA together with Kuhlim High Tech Park (KHTP) and Expandeers Global Network proudly present another seminar on expansion into Europe. This time it takes place in the high tech region of Penang at the West Coast of Malaysia. In September 2010 the EU Member States approved the launch of negotiations for a Free Trade Agreement with Malaysia. One month later, negotiations were launched in Brussels. After seven rounds, negotiations were put on hold in April 2012 at Malaysia's request. A stocktaking exercise is being finalized to assess the prospect to resume negotiations. In 2016, Malaysia remained the EU's 22nd largest trading partner in goods. Bilateral trade between the EU and Malaysia is dominated by industrial products. The EU mainly imports machinery and appliances and mainly exports electrical equipment and machinery (both ways industrial products account for more than 90% of trade). Other sectors of relevance in terms of EU imports from Malaysia are plastics and rubber and animal and vegetable fats and oils and in terms of exports, mechanical products. That balance however may change, as Malaysia is a High Tech spot in many segments including software, robotics and cloud based solutions. 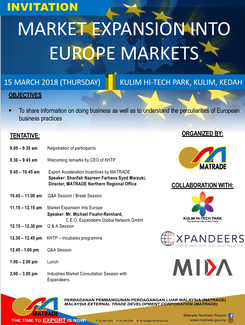 Join us in Penang to hear more about the relationship of EU and Malaysian trade.